I do love a challenge, and felt I wanted something to test my design skills a little more. 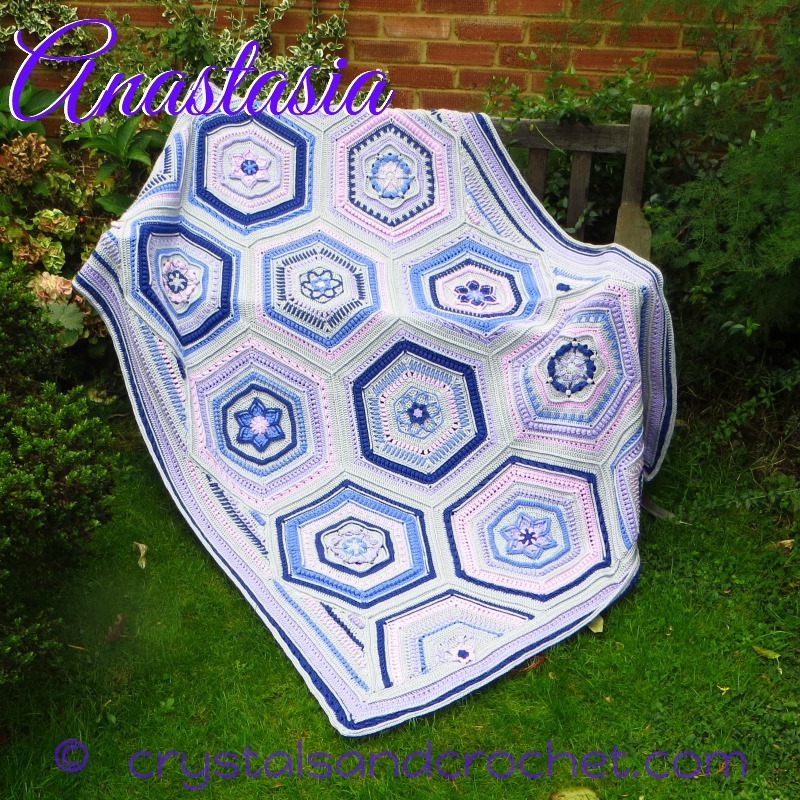 Anastasia is an old Greek name, and that of an ancient saint, the patron saint of weavers! Maybe the most famous person with this name was the youngest daughter of the last Tsar or Emperor of Russia. The name Anastasia means resurrection or one who will be reborn. I started this design just after my Mother passed away, and when the name kept popping in to my head, I just had to look up its’ meaning. It seemed perfect to me to design something that would symbolise that life, love, and hope all continue long after we are gone. And so, I named each of the pieces in the spirit of life, love, and hope. May you always allow your creativity to shine. Love and enjoy each, and every moment of life. Live life with flair, enthusiasm, and confidence. Allow your vitality to show in everything you do. I started to design these hexagons, without thinking how I was going to make the sides straight! Well, I did battle with three or four different ideas for triangles, and there was way too much frogging for my liking. And then like a bolt from the blue, the idea of making infills popped into my head. I now know why there are very few hexagon designs with straight sides!! But I got there in the end. I worked with my favourite yarn Stylecraft Special Double Knitting, and my trusty Clover Amour 4mm hook. The finished size of the blanket is 54 inches x 71 inches / 137cm x 180cm, that sits perfectly on the top of a UK double bed, or gives a lovely drape over the sides of a single bed. I had some left of each colour, but do be aware that if your working tension is looser than mine you may need extra yarn. There are no yarn packs available, but you can purchase the same yarn or choose your own colours, from Woolwarehouse or Deramores. Obviously in Aran/Worsted weight yarn, and with a larger hook, you will have a much larger blanket. Or another option, would be to make more hexagons, and have 5 columns rather than the three that I have done, again you would obviously need more yarn for that option. There is lots of texture within the stitches, and the design is a very dense, warm and snuggly blanket. The pattern is available in my Ravelry store, and is available as a photo tutorial, or written only pattern, in both US terms, and also in UK terms. There are video tutorials available for the special stitches used in this, and all of my designs on my YouTube Channel. Remember there is always lots of help available on my Facebook group Helen’s Hookaholics, and you are welcome to email me, using the contact page, found at the top of any page on my website. ♥ Here are some other gorgeous colour schemes. Ineke used Stylecraft Special Dk in beautiful autumnal colours. And Terena’s beautiful soft summer colours, also Stylecraft Special Dk. ♥ Please remember this is my design and is covered by copyright law. My deepest sympathies on your loss, Helen – yes, she is just a whisper away and yes, it is still not easy at all. Hugs. And I have to tell you how meaningful it is to me to see how each of your patterns is a blessing! May you receive as many as you bestow… and you’re surely blessing us all both with your patterns, your instructions and patience, and the special enjoyment we and others get from the finished products over time. My condolences on the loss of your Mum. Having lost my own Mum some years ago, I understand the depth of your loss. But you are so correct – that she is always with you. There are times when I can almost feel my own Mum’s arms enfolding me in her hugs – and can ‘see’ her smiles when I am happy. Last year when I was on a cruise, I swear I could I was wishing Mum and Dad could be there with me as I watched the beautiful glaciers in Alaska- and then I felt a ‘warmth’ and could almost actually ‘see’ my Mum and Dad next to me and know that I did feel them right there with me! Best wishes – it does get a bit easier as time goes on, but if you are like me, you will never stop missing her! I give up. 3 captcha’s and comes up wrong. I can read! Buying this as my grandmother’s name is Anastasia. Peace, love and light to you! Your mother is only a whisper away as you said. Thank you for sharing your creations with us. Keep shining! This is Beautiful, Again you have Created another work of art through crocheting. Can’t wait to make this throw. I love this pattern and your designs. I’ve made a few of them can’t wait to start this one. Helen how much will the pattern be? Beautiful, can’t wait to see the pattern. I love it and the sneaky peaks but boy do I not like waiting. I guess I’m a spoiled brat who needs more patience. It’s a beautiful pattern and I really can’t wait!